Nice staff that are always helpful.The shuttle driver is polite also. Nice stay. Short and sweet. Will definitely be back if I stay in the area again. Front Desk staff need to be trained in customer service and priority. They couldnt find my reservation during check in under my name, had to find my confirmation number or they could not check me in. Coffee service ends at 10 am I came down at 10:30am and was told I had to pay for coffee until i made it a point that i am a paying customer. Upon check out, clerk decided to ignore me and sign for a UPS package. Wont be staying here again after 2 previous stays. Staff were great, room was great, pool is small and shallow, fitness center is nice, breakfast was poorly laid out. Hotel front desk staff was not always available immediately; often left their post for a few minutes. Breakfast food was disappointing for a major chain hotel. Hotel shuttle was very helpful and available. Room was fine and clean. This is my 3rd stay at the Hyatt. I had my birthday party during this stay and it was everything I was looking to happen and everyone enjoyed the party. Bathroom was disgusting. Not clean, hair everywhere. Rest of room was clean and great for the price. It is a good hotel, within walking distance to the U of Chicago main quad. The room was good but the WiFi was completely unusable. Whole Foods is around the corner. After a long flight and wild taxi ride, I was happy to find myself in my room within a few minutes of arriving at the hotel. As a lone female business traveler, I am always concerned about nearby food options and was happy to find many in the Hyde Park area, in particular a Whole Foods less than a five minute walk away. Having a refrigerator in my room for my purchases was a huge plus. I like that my room has a sofa sectional. This allowed we to camp out with my laptop and get some work done while watching some TV. Just like home. We stayed at this hotel for one night but had a great time! Very helpful staff. Great shuttle service. Decent food options. This is a nice hotel around Chicago area. The night that I stayed was quite. The room was spacious. There is no street parking. You have to do valet parking or the public parking at the opposite corner of the hotel.Other than that everything was nice. I've stayed here several times and really like it. The staff are helpful. The rooms are great, and the location is perfect for me. Nice new hotel. Comfortable, large room. Helpful staff, would recommend to a friend. 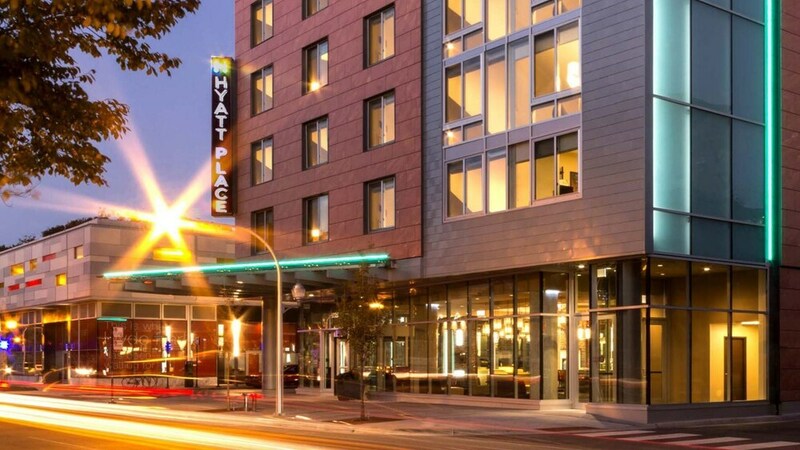 Hyattplace hotel is very good becasue of its excellent service although not cheap. However, it is worthy of consumption. For a foreigner consumer, I have very good experience as before in my homeland. In addition, very beautiful lake is very closed to hotel which attracts a lot of visitors and tourists of abroad. In one word, it is very great. Located in Hyde Park, Hyatt Place Chicago-South/University Medical Center is within a mile (2 km) of popular sights such as Chicago Museum of Science and Industry and University of Chicago. This 131-room, 3-star hotel has a bar/lounge, an indoor pool, and a 24-hour fitness center. For your convenience, a buffet breakfast is served for a fee on weekdays from 6:30 AM to 9 AM and on weekends from 7 AM to 10 AM. Entertain your taste buds with a beverage at the bar/lounge or coffee shop/café. Guests can expect to find free WiFi and 42-inch a flat-screen TV with satellite channels. The bathroom offers hair dryers and designer toiletries. Other standard amenities include an MP3 dock, a sofa bed, and a sitting area. At Hyatt Place Chicago-South/University Medical Center, guests enjoy features like an indoor pool, a 24-hour fitness center, and free WiFi in public areas. Valet parking is available for USD 39.00 per night, and there's also a free area shuttle. The front desk is staffed 24/7 to help with dry cleaning/laundry, concierge services, and securing valuables. Additional amenities include a 24-hour business center and free newspapers. Thank you for staying with us! We appreciate the feedback. Dear Anne, Thank you for staying with us. We are doing a new rollout of the breakfast on Nov 1st. I hope it will be to your liking. Best, Leroy B. Happy birthday! We are so happy that you enjoyed your time with us. We hope you keep us in mind for next year. Thank you. Thank you for taking the time to rate our performance. We are sorry that you had a subpar stay. Please alert us in the future if you find that something is not to standard. We will use this review as a training tool. Thank you for staying with us. We appreciate your high rating considering our Wi-Fi issues. We have contacted our provider and we are in the process of upgrading our bandwidth. We hope this will remedy any future concerns. Thank you for staying with us. Thank you Holly for such a stellar review. We are happy you were able to find comfort in the neighborhood and here at the hotel. We look forward to seeing you again. Thank you so much for staying with us. Buffet breakfast is served on weekdays from 6:30 AM to 9 AM and on weekends from 7 AM to 10 AM for a fee. Guest Kitchen - Restaurant serving breakfast, lunch, and dinner. Kid's menu available. Open 24 hours. Recreation features at Hyatt Place Chicago-South/University Medical Center include an indoor pool and a 24-hour fitness center. Guests with plans to arrive after 11:00 PM must make arrangements in advance by contacting the property using the information on the booking confirmation. It is Hyatt's practice to enter any occupied guestroom at a minimum of once within a 24-hour period, even if a guest has requested privacy. Appropriate efforts are made to provide advance notice to the registered guest before entering an occupied guestroom.